Today I encountered a problem in which none of my files on iCloud could be opened. The issue (almost certainly self-inflicted after I’d been poking around in iCloud’s underbelly…) was peculiar in a couple of ways. Although all files refused to open, Quick Look had no problem displaying every file’s contents (shame that we lost the ability to cut and paste from Quick Look in El Capitan, as that would have presented me with an option for recovery). Another oddity was that iCloud files that were currently open could still be saved to, but once closed, refused to open, showing the dialog above. Yet more worrying was that neither copying and pasting a file to another location outside of iCloud with the Finder nor trying to restore from Time Machine worked. Logging out and logging back in again also did not resolve the problem, as I’d hoped. However, I was prevented from just trying a full restart as I had critical processes running elsewhere on the computer. One option that I successfully employed was to use the ditto tool on the command line to copy a Pages document to another location (note that the Pages format is actually a directory rather than a single file, so ditto is a good tool for this). However, while this might be useful in an emergency, it’s hardly a practical solution to repairing the whole of the iCloud Drive. I don’t fancy trying to reproduce the issue to see if the reboot alone would have solved it, but that would be my first step if the issue occurs again. Otherwise, the unlink, reboot, and re-link method seems to do the trick. Although Apple’s oddball TextEdit.app has a variety of good formatting options, the chances are if you do any kind of word processing, you have one or more of the heavy duty apps like Pages, LibreOffice or Ms Word. If, on the other hand, you’re a coder or scripter who needs a plain text editor, you likely use Tincta, Sublime Editor 2, BBEdit, Coda or one of the many other full-featured editors that can do things like syntax colouring, snippet saving, script execution and so on that TextEdit can only dream of. Indeed, Apple have strangely forsaken giving their homegrown editor even a ‘line numbers’ option (though see tip 5 below), making it all but unusable for scripting. 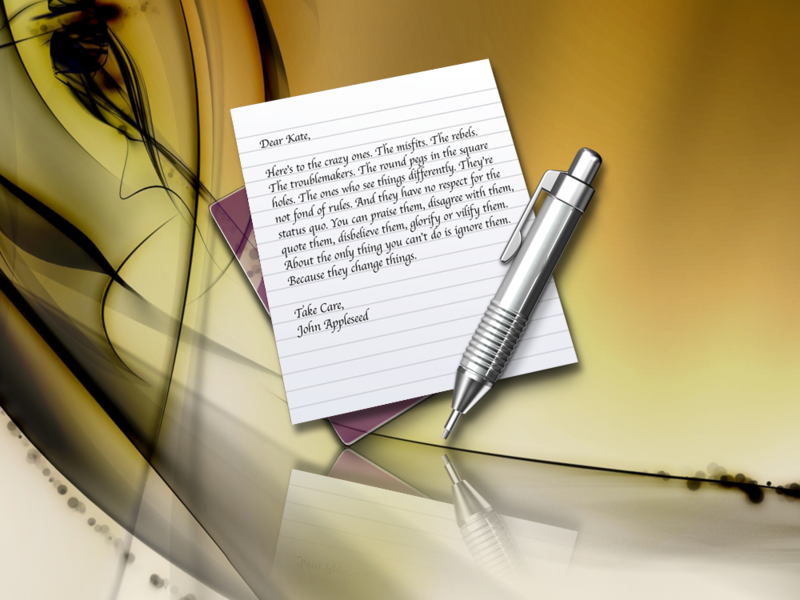 Given its limitations, you might feel you haven’t been missing much by leaving TextEdit unloved and untouched in the Applications folder. However, here’s at least 5 reasons to think again. 1. Easiest way to create an audiobook. 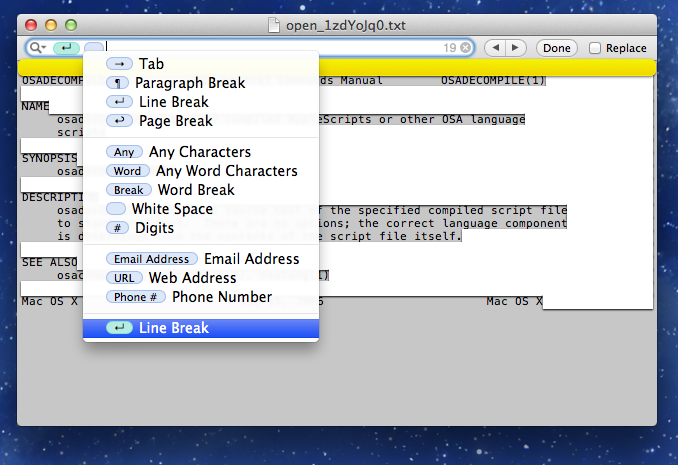 You can drag and drop any item from a Finder window into a TextEdit window to reveal that item’s path. 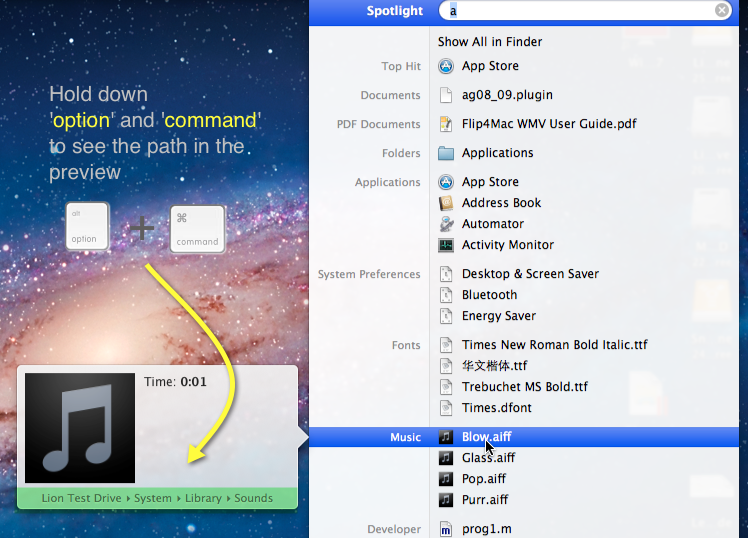 This is a very handy trick if you need to quickly copy a file path to the clipboard. You can also drag urls from Safari’s address bar into a TextEdit window, or just drop them onto its Dock icon to get the same effect. 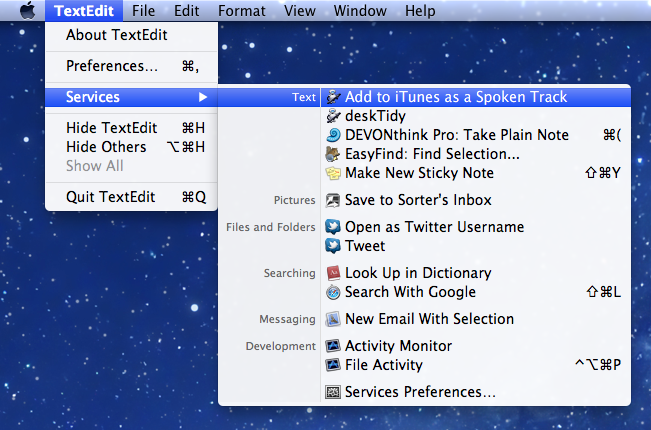 Although TextEdit lacks the ‘Share’ icon in the menubar that was introduced to many apps in Mountain Lion, you can still access the ‘Share’ feature through the contextual (‘right/control click’) menu. Another oddity of TextEdit lurks here though: make sure the cursor in the TextEdit window is not on an empty line, or you won’t see the ‘Share’ option in the menu. 5. (not so) Easy way to get line numbers! and hit ‘return’. 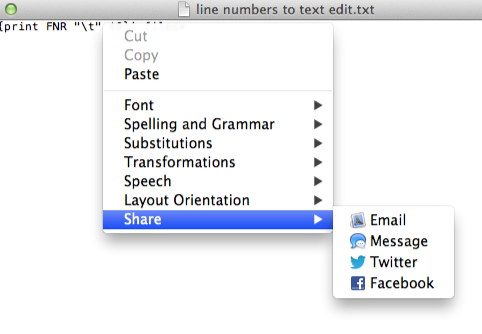 Hey presto, you have a TextEdit file with “line numbers”. Now, here’s the catch. I called these ‘pseudo’ line numbers because unlike real line numbers, the numbers are actually part of the text. That means if you select some portion of the text that spans line numbers, the numbers will be selected and copied too. In other words, you can’t properly copy and paste text, so be sure to keep your original version of the file for future editing purposes (*EDIT: see a workaround for this provided by Caroline in the Comments below). 1. Copy or download the entire script from here FastTasks code and paste it into a text editor (TextEdit or Tincta, my favourite, will do). and press ‘return’ on your keyboard. You’ll be asked for you Admin password which will be invisible when you type it. 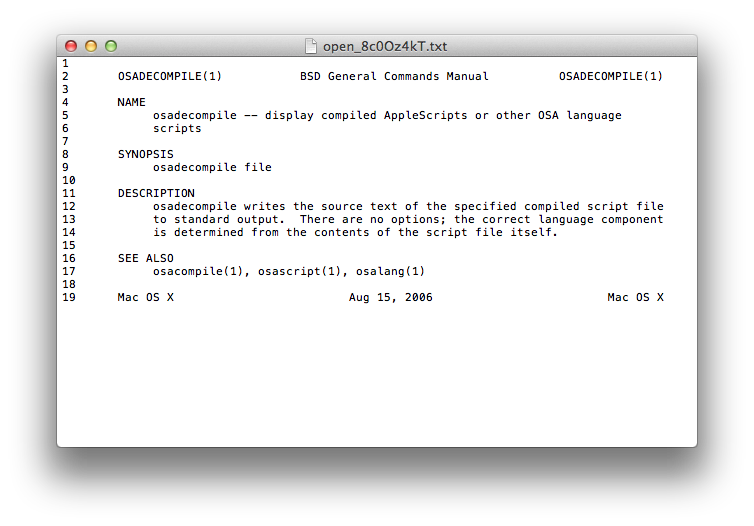 If you’re wondering what you’ve just done, you’ve just changed that plain text file into an executable program. As a result of that last command, you can now use the script by typing ‘FastTasks’ in a Terminal window or by double-clicking ‘FastTasks’ in Finder or on the Desktop. and change the dropdown menu from ‘Don’t close the window’ to ‘Close if the shell exited cleanly’. 1. FastTasks is actually quickest to run by using Spotlight and Terminal. If you have the Spotlight hotkey set up (usually cmd-space by default), simply open Spotlight, and type ‘Term’ and hit ‘return’ on the keyboard. At the Terminal prompt type ‘fasttasks’ and hit ‘return’. 2. Running it this way has another benefit. If you want to run FastTasks again after performing one task, just hit the ‘up’ arrow on the keyboard (hitting the ‘up’ arrow repeatedly will take you through previous commands entered at the Terminal prompt. Use the ‘down’ arrow to go forward), then ‘return’ when you see ‘fasttasks’ on the command line. With the announcement that the developers of Perian are to discontinue their QuickTime plug in, it’s probably time you switched to using the open-source video player VLC. Not only does VLC play video files that QuickTime can’t play even with Perian, it will also attempt (and often succeed) to play files that suffer from minor corruptions. 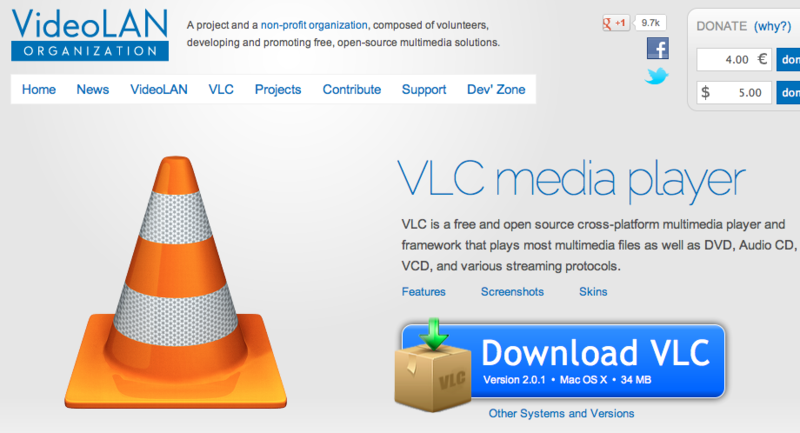 If you’re having problems playing a video file in QuickTime, chances are VLC is the answer.